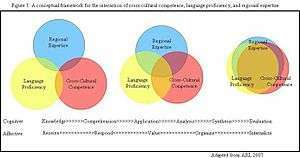 A theoretical construct for cross-cultural competence, language proficiency, and regional expertise. ↑ Messner, W., & Schäfer, N. (2012) The ICCA Facilitator's Manual. Intercultural Communication and Collaboration Appraisal. London: GloBus Research, p. 41 (also see: http://icca.globusresearch.com); Spitzberg, B. H. (2000). A Model of Intercultural Communication Competence. In L. A. Samovar, & R. E. Porter, Intercultural Communication - A Reader (pp. 375-87). Belmont: Wadsworth Publishing. 1 2 Selmeski, B.R. (2007). Military cross-cultural competence: Core concepts and individual development. Kingston: Royal Military College of Canada Centre for Security, Armed Forces, & Society. 1 2 3 Abbe, A., Gulick, L.M.V., & Herman, J.L. (2007). Cross-cultural competence in Army leaders: A conceptual and empirical foundation. Washington, DC: U.S. Army Research Institute. ↑ Bloom, B.S. (Ed.). (1956). Taxonomy of educational objectives: Handbook I: Cognitive domain. New York: David McKay. ↑ Krathwohl, D.R., Bloom, B.S., & Masia, B.B. (1973). Taxonomy of Educational Objectives, the Classification of Educational Goals. Handbook II: Affective Domain. New York: McKay Co., Inc.
1 2 3 4 5 "Geert Hofstede cultural dimensions". ClearlyCultural.com. ↑ "Cultural Intelligence Portal". www.cq-portal.com. Retrieved 2016-04-15. ↑ Halim, Haslina; Bakar, Hassan Abu; Mohamad, Bahtiar (2014-11-06). "Expatriate Adjustment: Validating Multicultural Personality Trait among Self-initiated Academic Expatriates". Procedia - Social and Behavioral Sciences. The International Conference on Communication and Media 2014 (i-COME’14) - Communication, Empowerment and Governance: The 21st Century Enigma. 155: 123–129. doi:10.1016/j.sbspro.2014.10.267. ↑ Kitsantas, A. (2004). Studying abroad: the role of college students' goals on the development of cross-cultural skills and global understanding. College Student Journal, 38(3). Retrieved July 9, 2007 from ERIC database. ↑ Lessard-Clouston, M. (1997). "Towards an understanding of culture in L2/FL education". Ronko: K.G. studies in English. 25: 131–150. ↑ Lievens, F.; Harris, M.; Van Keer, E.; Bisqueret, C. (2003). "Predicting cross-cultural training performance: The validity of personality, cognitive ability, and dimensions measured by an assessment center and a behavior description interview". Journal of Applied Psychology. 88 (3): 476–489. doi:10.1037/0021-9010.88.3.476. PMID 12814296. ↑ Davis, B. (1993). Tools for teaching. San Francisco: Jossey-Bass Publishers. ↑ Doll, W. (1993). A post-modern perspective on curriculum. New York: Teacher's College Press. ↑ English, F. & Larson, R. (1996). Curriculum management for educational and social service organizations. Springfield, IL: Charles C. Thomas Publishers. ↑ Palomba, A. & Banta, T. (1999). Assessment essentials. San Francisco: Jossey-Bass. ↑ Messner, W. & Schäfer, N. (2012). The ICCA™ Facilitator's Manual London: Createspace. ↑ "What is The ICCA?". Intercultural Communication and Collaboration Appraisal. GloBus Research Ltd. Retrieved 25 June 2012. ↑ Madison, Greg (2006). "Existential Migration". Existential Analysis. 17 (2): 238–60. ↑ Witte, A. "Making the Case for a Post-National Cultural Analysis of Organizations," Journal of Management Inquiry (2012) 21:141. Originally published online 13 September 2011.